Do you want to win Dhs105,000 worth of free spa, salon and well-being treatments? 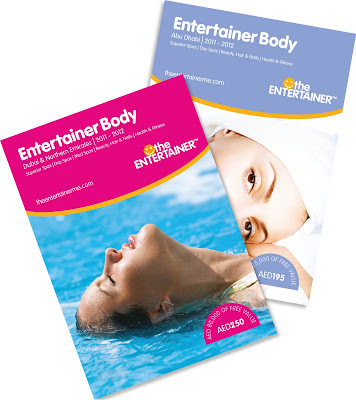 With the Entertainer Body voucher books, you can! And we have a set to give away today. To be in the running to win, simply tell us why you need to chill out. To leave your comments, just click on the post’s title. Actually, I wanna win this for my sister, she's the bread winner of our family for the past 10 yrs.. And she sacrifice a lot of things even her own happiness..lately she's so depressed.. She felt like all these years she's trying to make other people happy but no one knows she's going through a tough times, this would help her to relax and in some ways make her feel so important.. I want her to be happy in my own little ways.. She's my everything... So I hope I could win this for her..
the most important reasons for me is that our life is too short to spend running a race. i want to relax and take care of my self more specially becuase i am a pregnant lady in the last months ... feeling so tired and lazy to take care of my self at home.... stress... big reason , stress can lead to long-term health problems, just as smoking, alcohol abuse, or overeating can. I guess my mom needs to chill out since she is always on her toes..
She takes care of my younger bro ( who is a special need child ) & needs attention always. She also needs to take care of rest of house stuffs since my dad is aways in india for work related stuff for more than 6 months now. She also takes care of my niece who is just 4 months old while my sis is at her work. I guess she really deserves a SPA BREAK. I guess my hubby needs to chill out since he works for a bank, working in sales team, so he is always outside, either driving or out in sun. Moreover he works 6 days a week so he doesnt gets time for everything. I guess he needs to CHILLL.. Listening to exotic vacations that my friends are planning to take in the summer is giving me the blues. I don't plan to take a vacation till the end of the year, which means I am stuck in the scorching heat of Dubai. I would love to win these great spa deals so I can pamper myself through the summer without noticing any of my friends gone. well lets start, when you have two little kids (akram 2 years. khaled 8 months) and you are all alone in a strange country ,no one helps you with nothing and all the responsibilities of the kids ,the house on your shoulders you kind off need a break and need to chill a little ..
if you ask me on the last time i had fun i will say i dont have a specific answer it was a very long time ago that i cant remember. so can you plz tell me what "chill" words means because it was cut from my dictionnary !!! 1) I have not taken a vacation ever since September 2010- yes you read right...2010- it will be a year since I havent taken vacation/ days off from work. 2) I have a wedding to attend in September that's in Dubai and I would really like to get a glow on my face (spas...here I come! ), have beautiful hair color and primped up nails. 3) As a woman, I want to be pampered like crazy in the best spas. Well 2011 has not been a good year so far, I got dumped by my boyfriend of four years. I was expecting him to pop the question but he dropped the bomb on me instead. To cope with the breakup, I diverted my attention to my work. It has been 6 months since the break up and I am sure I am going to bump into him at a common friend's wedding. I need to look a million bucks at the wedding to show him what he has lost and to mingle with other eligible men at the wedding. I need to chill out because... My friends tell me that I do get angry so fast and react negatively on mistakes done by others and even myself. This is not the person I know of me. Before (during my early years in Dubai - from 1997), I was very patient, understanding and forgiving. It breaks my heart to see this change and have taken measures to go back to my old self by regular exercises at the gym so I can let out the steam in me due to work / relationship stress. Hey Cosmo! I would actually like to win this for my dearest Mother of six children, who puts everyone else's happiness before her own. She's a tough woman with an unbreakable spirit, despite struggling to make all ends meet and doing it all on her own without a special partner in life. I know she can do it all, but I know she needs a break as well; I wish there was something I can do to make her completely happy. She hardly ever spends a dime on herself as she's always thinking of the bills that needs to be paid and saving up for her kids future. I think that a woman like my mom is a someone who definitely needs a SPA break every once in a while! And despite being all strong and tough on the outside, I know my mom is a very sensitive soul trying her best to face everyday's challenges headstrong. I need this so bad, I just turned 30 this month, and everywhere I look around friends and colleagues younger than me are getting engaged, married or expecting. I am still so single, and I guess I need to sit back and relax and settle down my hyper state of mind, and rethink what am I doing wrong ? Plus some pampering would go a long way in regaining my confidence. I am just really looking forward to winning this. Being a single mom and working mom at the same time is very hard but a fulfilling task for me especially when you see the harvest - it's all worth it and chilling out helps me to rejuvenate my mind, my body and my soul. I have a 2 years old son and I don't have a job. I am currently looking for a job that will suites my time to my child and to my work.I am doing walk-in-interview within the heat of the sun just to find part time job to sustain our daily needs specially to pay for my hubby's credit cards :( and I need to chill out even just for a moment, to leave all the worries once in a while. Gosh, my reasons are so superficial compared to everyone else! I just love to enjoy and chill out ..now a days due to recession i am unable to go out to chill out as i hv my family in Dubai and things are really expensive in dubai and unable to fullfill the same..so if i win i will be really luck to enjoy ....hope to win..for me and my family.. I'd like this to use it with my Mom & my best friends, I feel I've drifted away and not been able to spend much time with them. What better way to get back to spending time with them than over a pedicure. I would really love to win this one. Am a 39 years old single mother of with two teenage children. And since I came to Dubai year 2009 I haven't treated myself to even a simple facial. Having two children in college really requires so much money to send back home. So I need to make them my first priority and mine will come last. And up to now that "mine" never did happen. I really need to be pampered and be rejuvenated most especially now that I might need to look for another job. So I really need those heavenly spa treatments and rejuvenation to bring myself back to the fighting arena to land a better job. Help anyone? It would such a heavenly treat if you could pick me as one of the winners! I study medicine at a university far away from home.I live a the hostel and usually am under a lot off stress due to the hectic courses and the always `submit urgently` assignments.I have a month off for Ramadan before i start another semester.It would be a great if i can win this to relax and unwind before going back to university.Also it could help me save cash for my studies. I am in the middle of working a on new product invention with my partner, which we hope to launch before the end of the year and the stress and tension of work and money is never ending. We have been working on it for over a year,so stress levels are very high. I just can't wait to have everything done so that we can chill out a bit. There never seems time to pamper ourselves. I would love to win this, so that we can destress, relax and feel normal again. I've had a lot of bad experiences and very few good ones, but enough bad to make me do everything at home by myself. From mani's and pedi's to styling and colouring my own hair (not cutting lol)..i would love to feel pampered.Ive been 12 years , grooming myself. now its time to lay back and get grrrroomed!